Sometimes ULMB can improve or hurt performance. It's not the right tool for all games, the key is to understand how to properly utilize blur reduction for maximum competitive advantage. Double image effects always happens when running at frameates at half the strobe rate. Note: You might have some minor strobe crosstalk (much fainter 2nd image), but that is normal. However, double-images from half-framerate situations are much worse than strobe crosstalk. Also, ULMB amplifies viaibility of microstutters (no motion blur to obscure microstutter). A single frame drop is blatantly visible even at 143fps@144Hz. Also, VSYNC OFF massively amplifies microstuttering/jittering in strobe modes. So please fix your mouse micro stutters (better 1000Hz mouse, better mouse pad), upgrade GPU, and lower strobe rate. 85fps@85Hz or 100fps@100Hz VSYNC ON strobing (+ low lag VSYNC ON tricks) can look visually much better than 110-130fps VSYNC OFF strobing at 120Hz. Even mouse microstutter is very massively amplified in strobed modes (I do not believe the mouse manufacturers falsely saying 2000Hz true-report-rates are unnecessary. For ULMB, we NEED better mice that can turn left/right as smoothly as a keyboard strafe left/right. 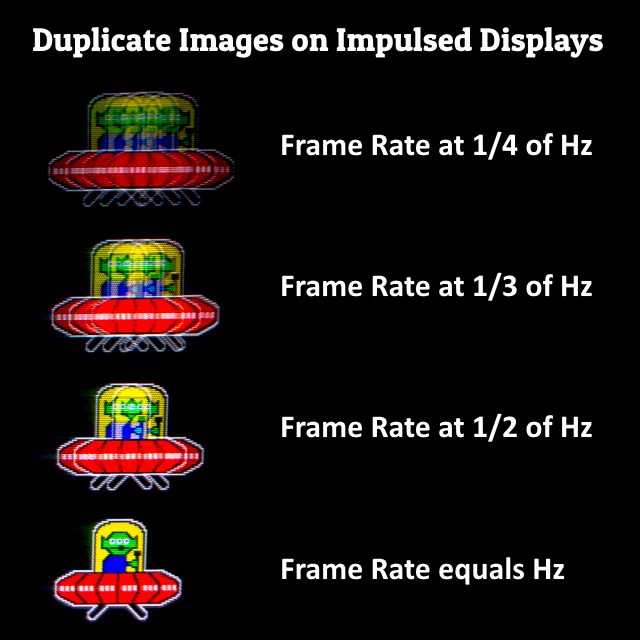 2000Hz true report rates *is* important for framerate-stroberate-locked high-Hz ULMB motion). For now, get the best and smoothest 1000Hz mice you can get. Perfect frame rate lock to strobe rate is the magic recipie for butter-smooth stutterless strobing. If you really, really do not want to do VSYNC ON (even the low-lag versions), then sufficient overkill frame rate (things like 300fps) can compensate for microstuttering during Fast Sync or VSYNC OFF for competitive ULMB gameplay. You will not get perfect motion fluidity but the more overkill you can get, the better ULMB becomes in non-locked situations. Old LightBoost was dim. Recent ULMB (and DyAc) monitors are much brighter, especially 144Hz ULMB on 240Hz eSports monitors. A quite decent colorful 300 nits in ULMB mode! And lower lag than 120Hz LightBoost. If you're still stuck with very dim LightBoost, upgrade to a recent monitor with bright strobing. All the newer strobe-capable 240Hz monitors currently have very bright 144Hz strobing. Know when to use ULMB competitively properly. - ULMB can improve human reaction time during tracking camoflaged moving objects in certain games (ULMB does not help in fixed gaze situations, as demonstrated by TestUFO eye tracking pattern), so ULMB helps certain games and gameplay tactics that forces eye movement, where the human reaction time improvements outweighs the slight ULMB lag. - Fixed gaze at crosshairs. You are immune to display-induced motion blur during fixed-gaze situations. ULMB only helps when your eyeballs are in motion, tracking moving objects. Many (not all) eSports CS:GO players keep a fixed gaze at crosshairs, using only peripheral vision to see enemies outside crosshairs. Mouse-turning/strafing to bring them into crosshairs, never moving eyes away from crosshairs. Absolute lag is more important than ULMB for gaze-only-at-crosshairs tactics. In these, human-react advantage of ULMB can end up outweighing strobe lag. The trick is to optimize to minimum strobe lag (maximize reaction time advantage of ULMB -- ULMB lag can be reduced down to as little 2-3ms average screen-center lag for 144Hz-240Hz strobe). And fix the ULMB jitteriness/microstutter (upgrade mouse, upgrade GPU, do appropriate tweaks, and do the triple lock where possible!) Then "arcade-CRT-clear perfect motion fluidity" can beckon to a competitive advantage. The list of all ULMB/DyAc/strobed monitors is found at Official List of Best Gaming Monitors. If you want the brightest least-lag strobing for competitive advantages, many strobe-capable 240Hz monitors often provides a decently bright ~300 nits during strobed mode with extremely little strobe-related lag. Remember, you can turn on/off ULMB very easily via monitor menus. AKA: "Why doesn't it help me in CS:GO, but it helps me more in certain different games?" The animations at http://www.testufo.com/eyetracking and http://www.testufo.com/persistence are your friends in helping you understand display motion blur issues better. Motion blur disappears if you stop tracking eyes. 1. Stare at the stationary UFO. You see vertical lines clearly, but stars are hard to see. You're immune to display motion blur. ULMB won't help competitively. 2. Eye-track the moving UFO. Vertical lines disappear due to motion blur, but you see stars better. You're at mercy of display motion blur. ULMB can help competitively. 3. Turn on ULMB (or view on a CRT) and eye-track the moving UFO. Now you easily see both the vertical lines and the stars (line gaps) at the same time! As observed, there are different competitive advantages, depending on your game eye-tracking habits & tactics. Is stars your figurative enemy? Or are the vertical lines the figurative enemy? Or both are enemies you need to see at the same time? In certain types of games, it could be both. To see both vertical lines and stars (line gaps) simultaneously, ULMB gives you that competitive advantage. ULMB won't help you for gaze-only-at-crosshairs (absolute minimum lag is more important). But it can help you catch that camouflaged moving object, to the point where faster human reaction time compensates for the input lag of strobing. This animation is a clear demonstration. There are many games with tons of motion (and few screen-stationary elements, no crosshairs, etc) where ULMB/DyAc can help competitively more than usual. Some monitors, like the BenQ XL2546, have strobing (DyAc) on by default, since they've reduced strobe lag to extremely low levels. In the past, many players used CRT gaming tactics (tracking eyes while turning in FPS shooter games). However, many modern eSports players moved away from that. For example, many adopt "gaze-at-crosshairs-only, use only peripheral-vision" to catch enemies, and flick-turn them to the crosshairs (to score) without moving eyes away from the crosshairs. This technique of fixed-gaze-only-at-crosshairs makes you practically immune to LCD motion blur. As a result, ULMB does not help. ULMB brings CRT-clarity LCDs back again, and is currently bringing back certain gameplay tactics formerly common in the CRT era. Everybody plays differently, so everybody benefits very differently from ULMB in different games. The key to understanding how to use ULMB competitively is knowing how to wield the "ULMB sword" correctly, bright and stutterless ULMB, with the right game/gameplay/tactics. If you can achieve overkill frame rates (e.g. 300fps or 400fps), it can compensate quite a bit to smoothing out all the strobe-amplified microstuttering. The microstutter jumps (stutter vibration amplitude of moving objects) are halved at double frame rate -- e.g. 400fps VSYNC OFF looks much smoother than 200fps VSYNC OFF. This can be useful if you've got 240Hz strobing (e.g. BenQ XL2546 or LG 27GK750F) and still prefer VSYNC OFF. Things will always look smoother at framerate = refreshrate = stroberate. However, if you have overkill frame rates, VSYNC OFF may no longer have the strobe-amplified jitteriness. Even with the strobe lag penalty, strobing can be a suitable competitive advantage if used properly for the right game & specific gameplay tactics. You should use ULMB to reduce human lag (in a way that exceeds the very, very tiny ULMB-technology lag on newer ULMB monitors). All ULMB monitors lets you turn ULMB ON/OFF. It's a great competitive tool to have in a toolbox, once you know how to use the tool correctly: Using it for specific games that demand gameplay tactics that ULMB benefits. Situations where human reaction time savings consistently exceed the tiny strobe lag. And knowing how to get the game to co-operate well with ULMB/strobing. Blur reduction modes remove motion blur that normally hides lots of tiny microstutters. So turning on ULMB/DyAc/etc can amplify visibility of microstutter. You must compensate by making everything as super-smooth at everything else. Microstutters can also reduce the benefits of blur reduction, because all that shakiness/jittering re-blurs things again slightly. Now with blur reduction (ULMB/DyAc/ELMB/etc) you have to compensate for all those jitteriness/tiny microstutters normally hidden by regular display motion blur. - You MUST keep Control Panel "Set a pointer speed" in exact middle notch. - Set reasonably high DPI like 1600, highest native DPI your sensor remains accurate (and non-floaty) at. Don't use max setting which is often interpolated, but the setting about one or two notches below max. If your mouse is one of the newest sensors capable of 12800dpi, try testing 3200dpi if your game's sensitivity settings can be set ultralow enough to compensate. - If you play competitive at low lag, then overkill framerates far beyond refresh rate (e.g. 300fps+) can compensate a lot for microstuttering. - Choosing a monitor with a higher-Hz ultra-low-lag strobe tech (e.g. some strobe tech has less lag, such as BenQ's XL2546 DyAc at 240Hz) can also help you achieve smoother strobing during VSYNC OFF at high frame rates. - Alternatively, VSYNC ON does miracles in removing strobe microstutters if you don't mind a bit of lag. As mentioned earlier, there are some low-lag VSYNC ON tricks available to compensate in part (there are multiple methods). Many people enjoy ULMB+VSYNC ON for solo gaming for ultra-smooth scrolling that is perfectly as smooth and sharp as TestUFO. In fact, some people reduce refresh rate slightly for graphics-heavy game to achieve the perfect framerate-refreshrate match, if perfect stutter-free motion clarity is a bigger priority -- because 100fps@100Hz ULMB is much smoother than 100fps@120Hz ULMB. However, this is not ideal for highly competitive ultra-high-framerate games. Some of these will become future Blur Busters articles, too.